Earlier in the week I noticed one of my leeks was sending out a flower stalk (scape). As far as I can remember this is the first time I am having a leek flowering. Had to bend the flower stalk to take the photo. The length of the leek from the root end to the flower bud was over 40 inches long. My inquiring mind needed to know what the inside of a flowering leek looks like, reason I pulled the entire leek plant. 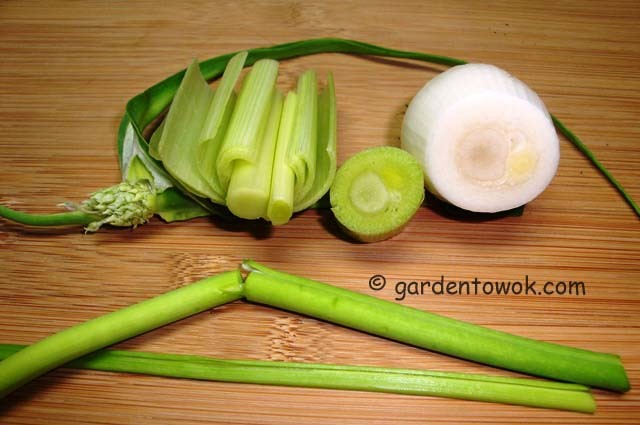 Top: Peeled Leek Flower Bud & Cross Sections of Flowering Leek. Bottom: Flower Stalk & a New Leaf. The larger circle in the cross section is the flower stalk the smaller circle is a new leaf. The flower stalk will become tough and inedible and from what I read the leek itself will become bitter. Fortunately I pulled the flowering leek as soon as I noticed the flower stalk and did not detect any bitter taste after cooking (I thinly sliced the leek and simmered the slices in a bit of broth so I can taste the leek itself). The white and light green section of the leek, including the flower stalk (up to the bent part, see first photo) was tender. I froze the leek greens and the green upper section of the flower stalk (it was a bit rubbery) for later use to make vegetable stock or for flavoring soups and other dishes. 1. Leek flowers are very beautiful and bees are attracted to them. Colors range from white to lilac to purple. Wonder what color mine will be? 2. Seed heads will develop once the flowers fade. 3. Each seed head will provide enough seeds for hundreds of baby leeks. If left in the garden these seeds will emerge as leek seedlings in the spring. 4. In about 6 – 8 weeks, baby leeks will grow from the base of the old (flowered) leek (this is similar to walking onion which I will be writing a separate post about at a later date, stay tuned). Remember the small circle in the above cross section photo that I say is a new leaf? Perhaps that will develop into a baby leek. 5. If I pull the entire leek plant once the flowers fade and start to develop into a seed head I will find small leek cloves clinging to the base of the old stalk. Separated and planted, each of the clove will grow into a new leek plant which I could use as baby leeks or leave in the garden and they will grow into full size leek plants ready for use in the spring (this is also a good thing, I can enjoy leeks in the spring) or I could use these cloves as baby onion substitute. The above information has gotten me quite excited and I am hoping to find at least 2 leeks flowering among my leeks. I will let one plant go to seeds and self-sow in the garden (if possible, I will collect some of the seeds to start indoor just in case I do not get volunteers in the garden). The other I will pull when the flowers fade and the seed head starts to develop so that I can separate and collect the leek cloves that are clinging to the base of the old stalk. I will plant some to observe how they develop and cook some to see how they taste. Too bad I cannot “hurry up” the process. The week’s harvest includes cherry tomatoes, red noodles long beans, green Chinese long beans, Ping Tung eggplant, Shanghai bok choy, amaranth, Swiss chard and walking onion. This entry was posted in Gardening, Harvest Monday and tagged cross section of flowering leek, flowering leek. Bookmark the permalink. Thanks for showing us the inside of a flowering leek Norma! Had never peeked inside one before 🙂 Look forward to hearing what color your leeks are – lilac and purple sound pretty amazing. This weeks’ harvest sounds colorful and intriguing. Love the sound of walking onion. You are welcome, I had fun peeling the layers to expose the center. I haven’t grown leeks in years, but I did have trouble with them wanting to flower. Wonder why you had trouble with them wanting to flower, my daughter and sister live in MA and grow leeks successfully. I have never in my life seen a flowering leek…this is just amazing! This is the first time my leek is flowering, could be the unusual weather we are having this year. When I first read ‘flowering leeks’ I though you were talking about the garlic chives relative. I don’t usually grow leeks so I have no idea about them flowering. It does sound like a fun experiment though! The alliums are such an interesting family. Dividing the leeks does sound a bit like chives or even clumping onions. I was surprised to learn you do not grow leeks, I thought you grow just about everything. I’ve never had a leek flower. They are biennials, but I suspect that with the right conditions 1 or 2 might flower the first year. That often happens with carrots and beets which are also biennials. This is the first time for me. I have a great deal of fun with the plants in my garden regardless of the results, I always learn something. So interesting it is to learn about these “leek cloves” and their uses. I am looking forward to seeing “leek cloves”. Interesting, I have never had a leek bolt on me but given the dry summer I have worried about it. I can see them producing seeds but it is surprising to find they also divide at the base. They definitely want to reproduce. I am thinking it has to do with our unusual weather this year. I’ve never really worked or cooked with leeks. So this was a great post for me. I got to learn something and I possibly will want to try them out now. Thanks Ms. Norma. Do try cooking with leeks, you will love them. I’ve read the same thing about garlic, letting it flower and seeding itself around the garden. I’ve actually had little bulbs form at the top of the leek stalk at the flower head when the plants were in their second year, but I never thought to plant them. From what I read, it takes 2 years for garlic bulbils to form cloves. The first year it will form a head like a small onion, replant this and cloves will form. Have not tried, may be next year. I see one leek flowering not sure if it will have sufficient time to form seeds as our night time temp is now in the 40’s and winter is just around the corner. Yes, gardening requires patience, I think farmers must be the most patient people. I can see why you’re excited…how wonderful it will be if your leeks self-sow. I tried growing leeks…same problem of not enough sun, but I do love them. Do you have room for containers? Bet one can grow leeks successfully in containers. That will be one of my experiment next spring. I do have room for containers, but very little sun other than on my deck. I might try that next spring, though. Thanks for the inspiration! The advantage of containers is that they are portable and can be easily moved to a more suitable location.